Earlier this year Birmingham's very own Reuben James brought the roof down at Corks with his fantastic band, Kansas Smitty's. 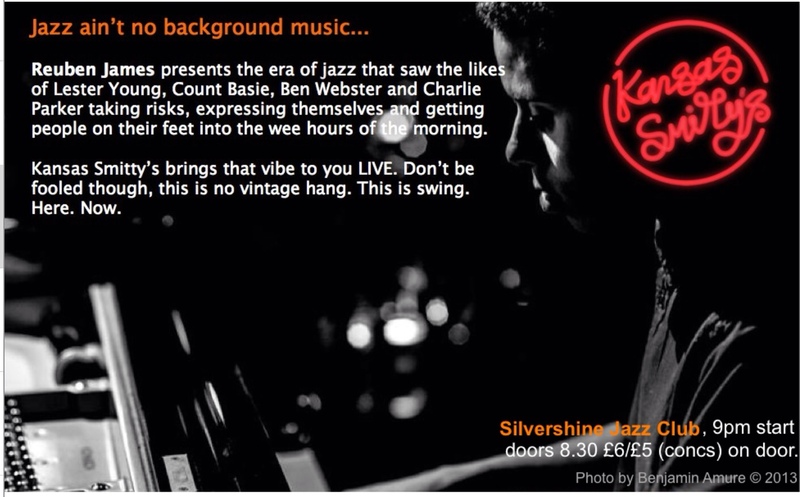 If you've been meaning to go to see live jazz at the Silvershine all year but never quite managed to make the time, find a babysitter, etc. this is your chance to see one of the best young bands playing today. The joint, will be rocking!!! Also, the staggeringly good tenor player Bobby Wellins is coming to the club on 19th December to do a workshop and gig, so if you know anyone who wants to attend the Jazz workshop, they can either contact us via the Silvershine Jazz Club website or phone Paul directly at 07719120560. The workshop runs from 5-7pm, with the gig starting at a later time of 9pm. Brilliant Bearwood Jazz……the Jazzy Joint will be jumpin’!